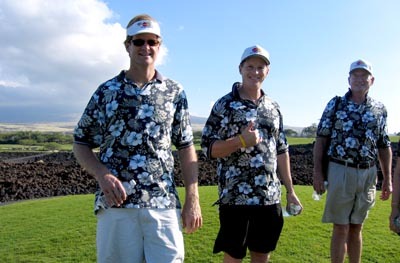 John, Dan and another volunteer at the MasterCard Championship at Hualalai Golf Club. A very long day with the tournament going 21 holes on this last day, three extra sudden-death playoff holes before Dana Quigley pulled-off the win. Click on the above image for a bigger size of this panoramic 180 degree image of the 18th green at Hualalai Golf Club. As you can see by the leaderboard Dana Quigley had the lead over Tom Watson as he played the 18th, but he blew a putt which forced the playoff. I was here on 18 waiting for Quigley to make his putt. I’ve got blisters on my feet from covering the golf, schlepping all that equipment all over the golf course. Actually I got the blisters yesterday when the leaderboard was malfunctioning and wasn’t being updated for 3-4 holes of play so I couldn’t tell who was in the lead or by how much so I had to chase down a number of players on the course. Today was a little better but still 21 holes to cover is a lot.